Winterizing your home is one of the most important steps to make sure your living environment is comfortable through the cold months we experience in Pennsylvania and Maryland. If you have the right system in place, winterizing your home won’t take as much time as you expect and preventative maintenance is more cost-effective than having to repair or replace something in the middle of the cold. While there are more steps you can take to thoroughly winterize your home, here are the top five that we recommend. Prior to turning on your heating system this winter, contact a trusted HVAC contractor to do a thorough inspection and cleaning. For less than $100, a contractor will do multiple safety checks including carbon monoxide, gas lines, and assure the blower and motor work properly in addition to cleaning the dust and buildup from not being in use. They will be able to share any concerns about needing to replace the furnace so you can plan in advance instead of being stuck with no heat unexpectedly. While the contractor is at your home, ask if he can inspect the heating ducts too. Heating duct leaks can cost you significant money in energy bills during the winter. Finding and repairing leaks early will help lower these bills and keep your home comfortable. Trim trees on your property. If you have trees on your property, now is the best time to trim them. In PA and MD, we typically experience snow or ice during the winter. Both of these can cause tree limbs and branches to break and fall on nearby structures like your home. Trimming trees in the fall helps you avoid roof, gutter, and window damage when a storm occurs. A roof inspection before the winter weather arrives is crucial. Professional roofers will check your attic to make sure the insulation is adequate and assure there are no leaks in addition to reviewing your roof and gutters for signs of deterioration. The best roofing companies will also take pictures to show you areas of concern that require immediate repair or a full roof replacement. Gutters are an important piece of your roofing system and guide water away from your home’s foundation. Clogged gutters in the winter result in ice dams on your home’s roof which blocks any of the melt from moving down the gutters. In many instances, this backup of water leaks into your home causing damage to the interior walls, ceiling, and flooring including mold and mildew. Check the exterior windows and doors. Take a walk around the exterior of your home checking windows and doors for cracks, holes, and gaps that allow cold air, moisture, and pests inside. Fill these areas with new weather stripping or caulk when possible or contact a contractor that specializes in window and door replacement if necessary. These are just a few of the steps you should take as a homeowner to prepare for the winter season this fall. What other tips do you have for homeowners? If you need help with your roof, windows, or doors this fall, contact Bealing Roofing & Exteriors today. 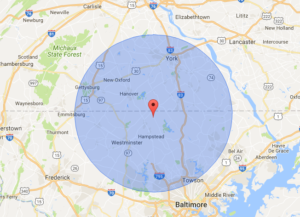 We service South Central Pennsylvania and Northern Maryland.